About once every couple of weeks, I stop by my local Safeway to get quarters for laundry. After I've secured my laundry money, somehow I always manage to get distracted by the products on the shelves (ooh, look at all those shiny labels) and end up spending more minutes than planned staring at products I eventually don't buy. And because my Safeway is frequented by many undergraduate students, I often overhear conversations while browsing that make me laugh as I think to myself, "Ah, so young and silly," which immediately makes me feel old. When my girlfriends tell me about arguments they've had with their significant others, being a dutiful friend, I usually side with the girl, but in this case, I had no choice but to side with the guy. Girl: Oooh, teriyaki sauce! Maybe I should buy this. Guy: Don't. You don't need it. Girl: But I like it! I want to get it! Guy: You can make it at home. It's cheaper. Girl: You can't make teriyaki sauce at home. Guy: Well, let's take a look at the ingredients. (reading from the label) "Soy sauce, sugar, water,..." This is all stuff you already have. You can totally make it at home. Girl: (still holding the bottle, reading more from the label) No, look! "Caramel coloring." See, we can't make it at home; we don't have caramel coloring! Guy: Woman, I'm just trying to save you some money! Seriously? No, really...seriously, people? Seriously? Talk about "senseless" violence. Exploration Leads to Discoveries, Good and Bad. Let's start with the bad first. On Monday, I had to get my car serviced. Since I have a new job, I had to go to the dealership in Vallejo to get my maintenance done. Mind you, I have never been in Vallejo. Ever. And as I drove from Vallejo to my office, I discovered that some of the worst drivers in the world can be found on the stretch of Route 29 that lies between Vallejo and Napa during weekday afternoons. I'm serious. I have ranted in the past on the illogical driving that I used to witness daily while commuting on the 580, but this was different. During my 30-minute drive on that short stretch of Route 29, I was too busy trying not to get into an accident in my loaner car to look inside the cars surrounding me, so I can only assume that every car was occupied by a drunk driver on his or her cell phone. That is the only way I can explain the dangerous swerving and unexpected speed changes that I was forced to navigate. What is wrong with these people?! If luck is in on my side, I will never, never have to drive there again. On the other hand, Saturday was a good day. I went to the Ferry Building in San Francisco to get some fruits and veggies at the farmers' market that is open every Saturday. After purchasing my vitamin supplies for the week from the various booths outdoors, I was walked into the building and passed by some dude at a table selling something called a bomboloni. 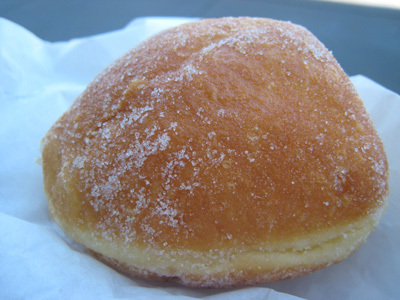 What is a bomboloni? It kinda looked like a fritter with some granulated sugar on the outside. My sister and I decided to be adventurous and try it. Based on the dude's suggestion, we chose a custard-filled one and decided to pair it with some coffee from Blue Bottle (I had the iced coffee---delicious!!!). 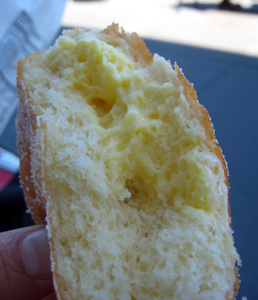 The verdict: This custard-filled donut-like pastry is good and would have probably been better when fresh versus being half-crushed in my purse for an hour. It comes with a variety of fillings, including Nutella, but because of the texture of the pastry, I imagine that the custard kind would be the best one. At the office building of my now nonexistent employer (thanks, economy! ), we had no free coffee. You had to walk down two floors to the cafeteria if you wanted hot water for your tea. Each of us sat in these ugly beige cubicles, surrounded by ugly beige walls that were only occasionally interrupted by giant hanging photographs of our merchandise, tinted a depressing shade of blue. My new office is different. Yes, for the most part you have those generic off-white and beige walls that seem to be standard for every office, but we also have accent walls. We have artwork on the walls. We have hot water a five-second walk away. A George Foreman grill in case your lunch requires grilling. Free coffee. Free drinks out of a Flavia machine. Pretty new, non-grimy cubicles. Nice, right? Well, I have a complaint. It's those cubicles. Sure, they're clean. Sure, there's no odd sticky spot that just will not go away despite how much cleaner you spray on it. Sure, they come with a cabinet where you can hang your coat. But one of my cubicle walls is a "window"! This is not ideal. I used to have a private office that had a terrible setup where my back faced my office door. For most people, this is bad, because they don't want people surprising them from behind while they're instant messaging or surfing some inappropriate sites or just goofing off. I don't like people looking over my shoulder either, but that's not a huge issue for me. I never surf work-inappropriate sites, and frankly, I think I'm competent and efficient enough at what I do that my bosses shouldn't give a crap if I do instant message or read the news or check my email while I'm on the job. So, usually the whole open cube thing versus having your own office doesn't bother me. It's the dang transparent window that looks out onto the rest of the floor. The only inappropriate thing I very occasionally do at work is space out. I can't help it...sometimes staring at spreadsheets for hours on end does that to me. If I spaced out in my old cube, no one could tell as they approached me, and once they did, the time it took me to swivel in my chair to face them was enough for me to recover my composure. But now I can't do that! People who approach my cube can see through the window right at my face as I look at my monitor. There is nowhere to hide! No blind spot! This is one area where I will shout a resounding "NO!" to transparency in the workplace.